CNet Training is proud to announce it has been awarded Associate College status by Anglia Ruskin University (ARU) in Cambridge, UK. CNet, whose UK headquarters is close to ARU, has been delivering the world’s first and only Masters Degree in Data Centre Leadership and Management in partnership with ARU for three years. The Associate College status confirms a long-term working relationship with ARU and provides CNet with responsibility for full delivery of the Masters Degree program. This official news comes as September 2017 saw the biggest intake onto the degree yet. This is another first and further accolade for the global leaders in technical education for the digital infrastructure education. The Masters Degree qualification will still be awarded by ARU with a full graduation ceremony and it continues to be recognised with the same academic integrity of all other ARU qualifications. The Associate College status carries with it robust quality and academic standards, which CNet is proud to uphold. ARU undertake on-going inspections to ensure the program continues to reach their quality standards, and, being a CNet program, it also conforms to the ISO standard that CNet adheres to. This quality focus ensures learners can be confident that they are receiving the best education possible. The Masters Degree is designed in collaboration with the industry, it’s dynamic content is constantly refreshed to ensure it reflects the very latest needs of the industry. Plus, being such a high level program, at level seven, it really does create the worlds’ elite data centre professionals. No other program offers data centre professionals this high level leadership and management education tailored to the data centre sector. The three year Masters Degree is a level seven program which sits at the top of CNet’s world renowned Global Digital Infrastructure Education Framework. The distance learning delivery of the program means that learners can study at times that are convenient to them, yet they can still easily communicate with their tutors and each other wherever they are in the world. Successful completion of the degree culminates in a graduation ceremony to receive the Masters Degree in Data Centre Leadership and Management in the famous city of Cambridge. Anglia Ruskin University, Vice Chancellor, Professor Iain Martin, said: “Our relationship with CNet Training is highly valued and we commend them on achieving the highly acclaimed status of an Associate College with the tremendous academic rigour this requires”. 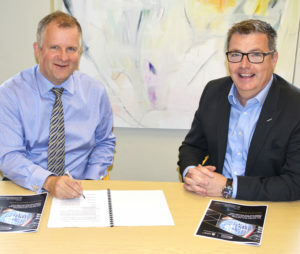 Professor Iain Martin (Vice Chancellor, ARU) and Andrew Stevens (CEO, CNet Training).